This piece was made for the Craftsman...by the Craftsman. For years, plans have been in our archives for a traditional Craftsman style Huntboard. This year Bill had the opportunity to finally get around to making this one of a kind piece! Several years ago while doing research on a project Bill discovered a Southern Huntboard that he fell in love with. Since we both love wine repurposing this piece to fit our life style made sense. In the short time it has been finished it has become a natural place to mingle around within our home. We would like to send this piece on tour to some of our favorite wineries for many to see. The Jessup Cellars tasting room is it's newest location. The piece stands 40 inches tall; the Top is 54 inches long and 17 inches wide. 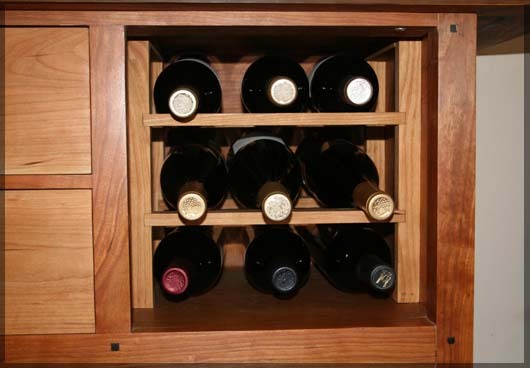 The case is 16 inches deep and contains a Stemware rack on one side and wine storage for nine bottles on the right side. African Wenge pins accent the joinery on the front face of the case itself. 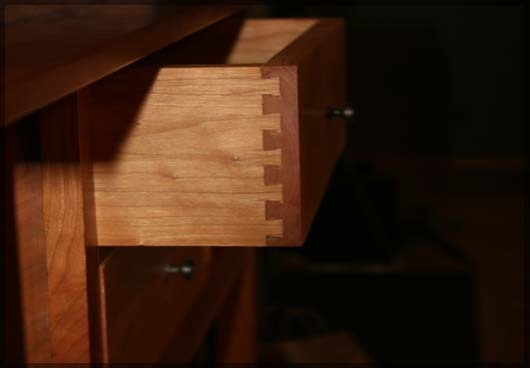 The drawers are blind dove tale construction, solid cherry drawers. We feel these will be a great storage area for fine silver, cloth napkins, and even possibly a small humidor. Both drawers fit flush with the face of the cabinet when they are completely shut. 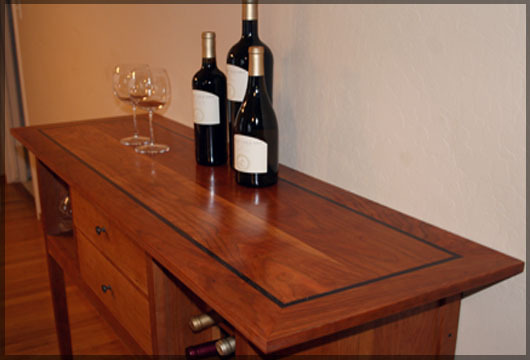 And have small oil rubbed bronze drawer pulls so as to not distract from the look of the cabinet overall. The piece is constructed of Allegheny Cherry and the top contains an African Wenge inlay around the outside perimeter. 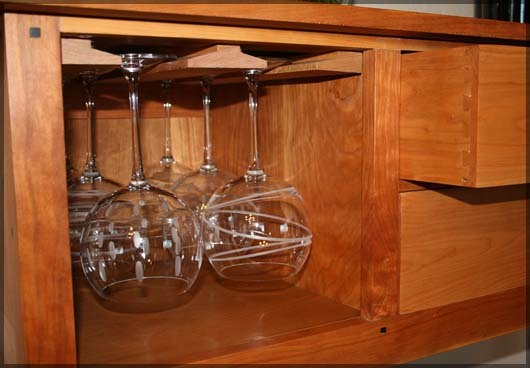 The top was constructed from four-quartered cherry and finishes at one inch thickness. The sheen of the finish was achieved with a traditional oil and wax technique. Once constructed the piece is carefully oiled on all sides, inside and out with linseed oil. A minimum of five coats of wax were used in this piece to achieve the gloss. Each coat was carefully applied and then hand buffed before the next one was applied. 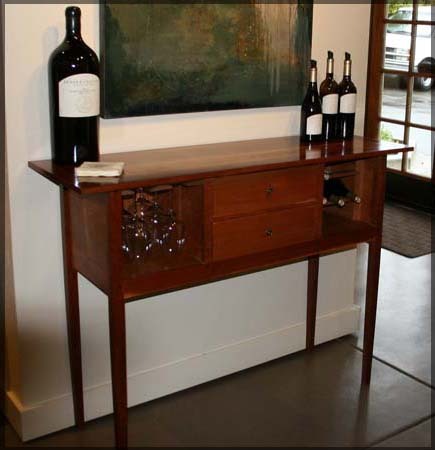 A new home, The Huntboard has made the journey to the famous Napa Valley. Its new home is now at Jessup Cellars. 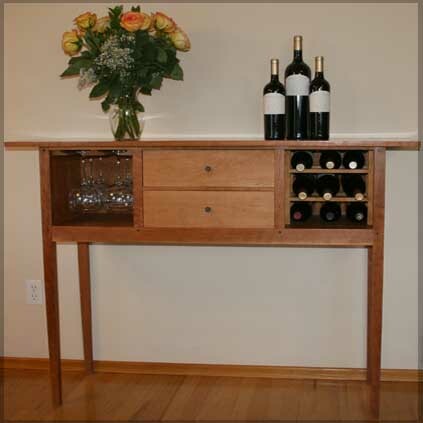 Our friends at Jessup Cellars invited us to bring the Huntboard to stay while we design and build a piece especially suited for their needs. More to come on the "New Jessup Piece"
Copyright © 2008 Carey Designs. All Rights Reserved. Designed by Carey Designs.